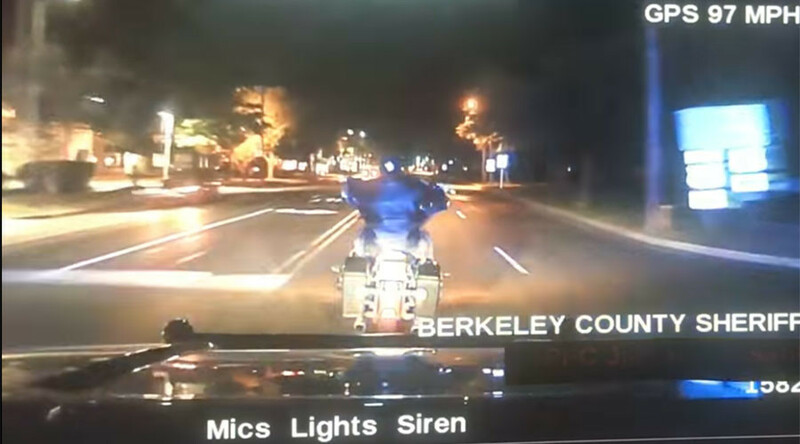 Dashcam footage shows Berkeley County deputy James Vansant’s cruiser hitting a speeding suspect’s motorcycle twice, at speeds near 90 miles per hour. The suspect then crashed and died, a result of being in the wrong gear, the sheriff’s office claims. The Berkeley County Sheriff's Office posted a video to their YouTube page on Thursday, showing a Wednesday night police pursuit lasting at least five minutes in Summerville, South Carolina. The chase that reached speeds of at least 111 miles per hour (178km/h) ended in a fatal crash for the suspect, 30-year-old Robert Lee Clark, Jr. of Goose Creek. The chase began at 11:51pm when BCSO deputy James Vansant saw Clark going 66mph (106km/h) on his motorcycle in a 45-zone (72km/h), Chief Deputy Mike Cochran said, WCSC reported. Clark is seen in the video braking hard abruptly before speeding off multiple times during the approximately 8-mile chase. Near the end of the footage, Clark is seen braking again, at which point Vansant’s cruiser bumps into the motorcycle at a speed of around 90 miles per hour. Then, at the 5:26 mark, Clark is seen being slightly thrown forward as his bike slows down and is once again hit by the police vehicle. Clark, not wearing a helmet, veers right apparently in an attempt to drive between a pulled-over vehicle and the sidewalk, but he crashes and is thrown to the sidewalk. The sheriff’s office statement says Clark missed a gear shift, causing him to hit the front right corner of Vansant’s cruiser, causing the motorcycle to lose control. Vansant is currently on administrative leave, pending an administrative review, Chief Deputy Cochran reportedly said. While the sheriff’s office conducts an internal investigation, a separate investigation will be done by the South Carolina Highway Patrol, according to WCSC. Paramedics pronounced Clark dead at the scene, and the county coroner found two ounces of marijuana, a marijuana cigarette, and a pipe on his body, the Post & Courier reported.